Natural Skin Whitening Recipes: There has been a time when products made up in laboratories were considered to be the best products on the market. This was mainly because a large share of population believed that those products represent the highest standard that a product could reach. However, time has proved that products made in laboratories are not faultless and that in many case the chemical substances used for their preparation were doing more harm than actually helping people. Thus, a large share of people has turned their faces towards nature and natural ingredients in the hope of finding an alternative to chemical products. Skin whitening is one of those fields which enjoy these two alternatives: chemical bleaching creams and natural skin whitening recipes. But which of these solutions is best for the skin? Let’s make a simple comparison of the two types of skin whitening treatments! Once you have some information about each of them you will be able to answer the above question all by yourselves. 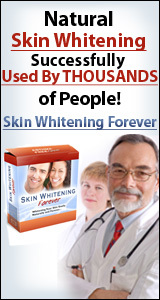 Second on the list of features a skin whitening product should have is safety. Unfortunately here there are some products which do not respect this feature. Chemical bleaching products have been reported to have side effects on different types of people. Most affected are pregnant women and people with sensitive skin. Because most of the ingredients are obtained in the laboratory, they can have quite a damaging effect on the human skin. The risk of allergies is even bigger as there are few people who have been testing these substances before. In case of the natural, homemade products, the risk of side effects is reduced to minimum, as most ingredients are used in cooking or are eaten as such. Also, because they can be made by the patient itself, the risk of allergies is completely removed, as people usually know what they are allergic to.